I just love [wikipop]Dogwood[/wikipop] blooms. So delicate and fleeting, it’s a magical flower. When not in bloom it’s a rather non-descript tree/bush but for a week or so in spring, they’re amazing. I’ve had a love hate relationship with the dogwood in Yosemite for a of couple years now. The timing of the bloom has proven to be my undoing. Try as I might, I always seem to miss “the peak” by a week or so. Maybe someday I’ll get it right. With just one or two non-native exceptions, the dogwood in Yosemite are all, white petaled, Pacific Dogwood. 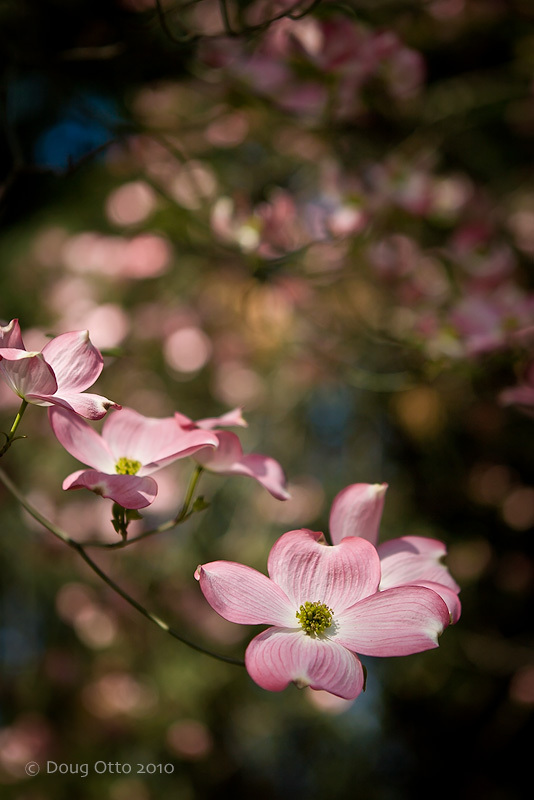 This image was taken much closer to home and is a pink variety of Eastern Dogwood. By much closer, I mean 175 miles closer. I made this photograph at the Jensen Botanical Gardens just 2 miles from my house. It’s a tiny little garden that now belongs to a local parks and recreation district. Park policy, for years, has been that photographers must purchase a $10 daily permit to make images in the garden. Apparently you can drag your easel and paints in without a problem but to take a picture it costs $10. After pointing out that disparity to a park official I’ve been told that I can shoot there any time. I’m not sure what the original thought behind the regulation was but it seems a bit silly. I made the image with my Canon 5D and 24-70 f/2.8f lens. I’ve considered replacing the lens with the 24-105 to fill a gap in my range but every time I see the buttery smooth bokeh this lens produces at f/2.8 I change my mind. This entry was posted in Photography and tagged bokeh, Canon 24-70 f/2.8L, Canon 5D, dogwood, doug otto, Jensen Botanical garden, Photography. Bookmark the permalink.